Earlier this year, eRevMax hosted its signature TigerTime at the FITUR International Tourism Trade Fair in Madrid in associate with World Independent Hotel Promotion (WIHP) and Ostrovok, Russia’s largest accommodation provider. Recently eRevMax partnered with WIHP to offer metasearch services to the hotels in to help hoteliers generating more direct bookings. At stand 8B19 Martin Soler of WIHP presented how can hotels lessen their dependency on OTAs by connecting to metasearch sites. 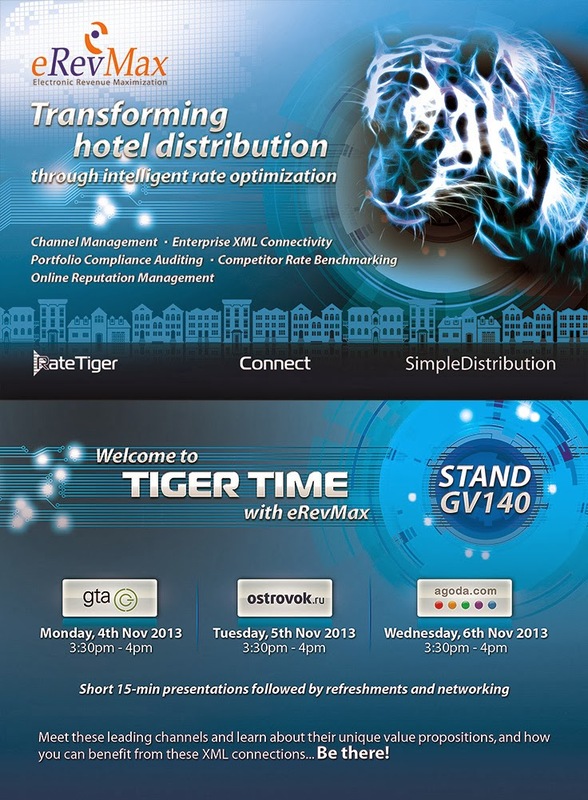 TigerTime by eRevMax is the perfect platform for hotels and OTAs to present their value proposition to a varied set of attendees. It helps them to showcase how hoteliers and OTAs can benefitted from advanced XML connectivity and how they can reach out to the diverse client base. Apart from being a great branding exercise, this platform put them directly in touch with key decision makers who can understand the value of networking. To celebrate hitting an important milestone in eRevMax history – serving 7000 happy customers – the company attended the 2013 World Travel Market event in London to show exactly why they’re considered a world leader in channel and distribution management. With help from their approved channel ecosystem which includes Agoda, GTA, and Russian-based Ostrovok, eRevMax used this opportunity to show how the popular RateTiger software has evolved and become flexible and diverse enough to meet the needs not only of independent hoteliers but also of mid-market hotel groups and large, global hotel chains. The event took place between 4th and 7th November at ExCeL Docklands. The biggest hotel search engine in Russia, Ostrovok has completed a 2-way XML interface with eRevMax to offer faster connectivity to its growing base of customers. With this integration accommodation provider will be able to update inventory availability and room rates in real-time helping them control pricing strategies and optimize their revenue. “We are glad to announce our partnership with eRevMax. RateTiger is leading e-channel manager on many markets and our partnership will help us to grow our hotel network both in Russia and in Europe.” said Pavel Babenko, Director for International Markets, Ostrovok. The partnership will revolutionise bookings and inventory control for Ostrovok, which requires increased efficiency due to hastening demand in Russia, where the online travel market is expected to cross $10 billion, accounting for 20% of the total travel market.